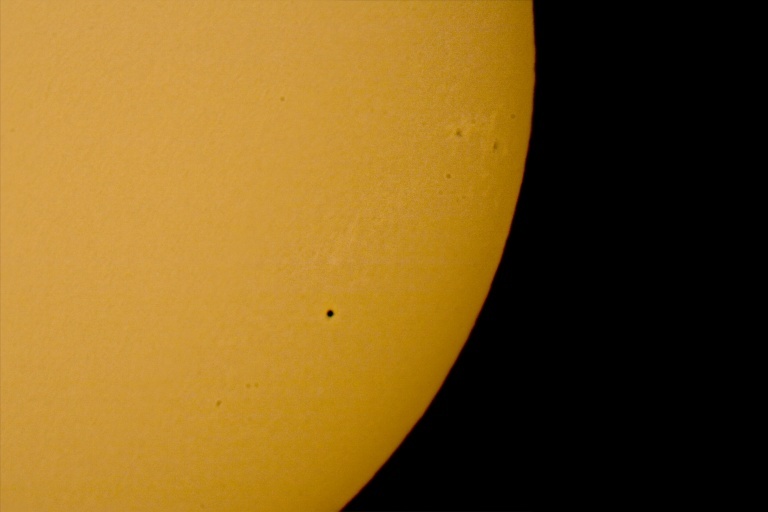 This image of the November 8, 2006, transit of Mercury was taken with a digital SLR camera mounted on a 5-inch refractor. A TeleVue 4x PowerMate was used to increase the magnification so that the planet's tiny 10 arc-second diameter black spot could be seen. I also took other images of this transit with a ToUCam web cam mounted on a 3-inch refractor. All of the images were taken from my backyard. This image was taken with a Cannon EOS Digital Rebel camera on a Takahashi FS-128 refractor. A solar filter was used over the front of the telescope.